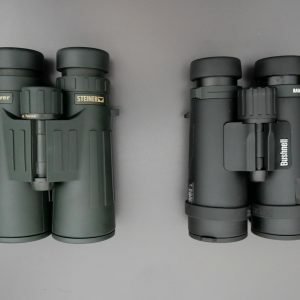 In this article, I will compare Steiner Observer 10×42 Vs. Bushnell Legend E 10×42. These two are similar binoculars, as far as usefulness and quality are concerned. We can buy them at a good price and both are pretty solid, well-made, aesthetic and will do their job well, especially for novice hunters and birdwatchers. Steiner Observer series are made for all possible situations and all kinds of observations in everyday life. The binoculars are also not too heavy to carry around, and their ergonomic design and ultra-resistant coating make them suitable for trips and other outdoor activities. Bushnell’s E series was only added a couple of years ago to the Legend line of binoculars. Their specialty is the all-weather assurance and high resistance. It is especially suitable for observations on the field and on water, even in extreme weather conditions. These two binoculars might have a similar purpose, but they are quite different from each other. Observer by Steiner is much bigger, longer and heavier than the Legend E. It looks pretty robust and firmly made and so does the Legend E, but the latter is slightly more elegant. Observer is coated in dark green solid and durable rubber, that has several bars all over the surface. Whole armoring looks like it was carved out of one big piece of rubber. The housing is made of long-lasting polycarbonate Makrolon® and NBR (non-slip, long-life) rubber. Each component of the binoculars is of the same dark-green color, so it fits the overall image. The binoculars look really resistant due to this armor and I would not be worried about them, even if they accidentally fell down on the floor. Legend E is a bit more convenient for carrying around since it weighs less. The armoring is made of matted soft rubber that has a tiny rhombus-shaped dotted surface on both sides for better grip. The binoculars are solidly built and excellent for holding in hands because they are not too heavy and do not slip out of hands. 10×42 is the perfect choice for birdwatchers, stalking and hunting, especially in the mountains and for observing the details in nature. 10x magnification gives you a feeling of being closer to the object/action and gather a large amount of light with the 42 mm lenses. This configuration is also very suitable for safari expeditions and traveling. As far as optical properties are concerned, the binoculars are quite similar to each other- both have multi-coated lenses, with almost the same close focusing distance and field of view (the latter is slightly wider on Steiner Observer). Observer is specially coated (STEINER High-Contrast Optik) for the maximal light transmittance, sharp edge-to-edge image, and accurate colors. Bushnell Legend E has its exclusive RainGuard® HD coating which transforms the moisture into small droplets that are easily dispersible. This special coating will keep your view clear and bright. Their lenses also have an ultra wide- band coating that gathers the maximum amount of light and sends it from the objective lens to the eyepiece. The image that we see is extremely bright and clear because of this. Focusing system on both binoculars is central. Legend E’s knob is covered in black rubber that rotates well but has a poorer grip. That is why I have evaluated its grasp with a 7/10 and rotation with an 8/10. I did exactly the opposite with Steiner’s Observer; I gave its wheel an 8/10 for grasp and a 7/10 for the rotation. The thing is, I prefer the Steiner’s central wheel, since it is much more quality made, solid and offers better grip, however, the rotation is a bit too fast and smooth. It is better for a central wheel to have a sturdier rotation so the focus settings cannot change that easy. Observer has the diopter setting ring placed on the left-eye (as usual) and Legend E on the right-eye. The latter is unfortunately very badly made- plastic and rotates all around the eyepiece until the central wheel “blocks” it. For this reason, we do not have the right feeling when the diopter has really been set up well. Also, the marker is way too big and impractical. Observer’s ring is well-made and it is slightly harder to rotate, so it enables precise adjustment of the diopter. Both models have a multi-positioned eyepiece type. Eye relief can be adjusted with the help of 3 click-stops. The observer’s eye-relief data could not be found but I guess it is almost the same as on the Legend E since almost all other proportions are more or less equal. The rotation of the eyepiece on Observer is a bit wobbly, unstable and making a squeaking sound. That is why I have evaluated its firmness with a poor 6/10. The silicone the eyecups are coated in is soft, durable and nicely shaped. I have evaluated it with a 7/10. Legend E’s eyecups are a bit harder and less comfortable when pressed to the face. It is also necessary to use a little more force to rotate them. I gave 7/10 for both, firmness and quality of the eyepiece on the Legend E.
As far as the exterior is concerned, I must again mention a durable and robust design of the Steiner’s Observer. The binoculars are very rugged and bulky. Their polycarbonate Makrolon housing is extremely resistant to temperature differences; binoculars perform without disturbance from -15 up to +55 degrees. These binoculars are used to poor conditions but nevertheless provide a very satisfactory optical performance. I have evaluated the quality of armoring with an 8/10. The exterior on Bushnell is more stylish, but also very sturdy and strong. With its RainGuard HD technology is also resistant to all possible weather conditions. I also gave an 8/10 for their armoring quality. Objective lens covers are on both models attached to the barrels with a thick rubber band. Both have their logos imprinted on them. AS for the eyepiece covers, I prefer the Legend E’s one, since it is made of rubber and fits better. The one on the Observer is made of harder plastic and is shaped like an oval bowl. Because of the bad eyepiece cover, I have evaluated Observer’s quality with a 7/10. I gave an 8/10 to the Legend E covers. Both binoculars are filled with Nitrogen and water and fog resistant. These two models are both available in two colors- dark green and black. They can be mounted on a Tripod and have a warranty period of 10 years. Bushnell Legend E is made in China but for the Steiner Observer, we do not have the exact information. We presume it is also assembled in China. People who helped me evaluate the binoculars were in all categories more on the Steiner’s side, 5/6 of them would buy it rather than the Legend E. As far as the optical properties are concerned, Steiner was more convincing, only results for Real Field of View ended in a tie. Bushnell’s design is much more aesthetic and modern, but as far as the optical performance is concerned, Steiner Observer was proved to be much better and useful. Both binoculars are packed in soft, black bags, that almost look like a vanity case. Neck strap and a cleaning cloth are included too.